Food, food and more food...good food, great food, the best food I know how to cook came from my Mama's kitchen. From the garden to the table...the best tasting...all year through. I have an idea and hopefully I have twenty some years to get it done. I'll need that much time! I want to make a cookbook for my children. Thus the name My Mama's Food. It has several meanings, for the entries in my journal it will mean me, my children's Mama. For me it means my dear Mom, their Mama Lu, for most of the recipes come from her and my grandma's and great grandmas. I do most of my cooking without a recipe, but sometimes they just need to be written down if we do not want them to be lost for future generations. When I left home I would have treasured a book like this, written by my Mom, so I want to try and do it for my children. I want to include photos of the kids helping me in the kitchen as they grow and eat what we make. What memories they will have when cooking in their own kitchen's and teaching their children to cook and sharing these memories with them and showing them pictures of themselves learning to cook with their Mama. I think it's a grand idea, now if I can pull it off! My favorite bakery, Truffles and Tortes in Anoka, MN has the best scones I've ever had and I've been trying to recreate their chocolate chip variety. After much trial and error I think mine are just as good! This makes 16 to 20 scones, depending on how big you make them. Directions for making fruit filled scones follow the recipe. Preheat oven to 350F. Line 2 baking sheets with parchment or butter them generously. Combine flour, sugar, baking powder, salt and chocolate chips until well combined. Create a well in the center and pour in heavy cream, butter and vanilla. Stir by hand until combined. Using flour on the counter I press the dough into a rectangle and fold it in threes. Pictured below, if you are not using berries omit them from the steps below. Brush with butter, then heavy cream and sprinkle with sugar. Bake 20 to 30 minutes depending on the size or until slightly golden brown on the edges. If you can't bake both pans at the same time place the second pan in the refrigerator until ready to bake. Let cool nearly to completion on a wire rack before enjoying! They freeze very well after they are baked or before. For freezing before baking, freeze on a cookie sheet and then bag them when they are frozen. Let them thaw and brush with toppings before baking. I wouldn't freeze the berry varieties, they will get mushy and watery. The berry varieties freeze better after they are baked. I used strawberries, but blueberries and raspberries are on my list to try real soon! Pat out your dough to about 1/4 to 1/2 inch thick. Place the fruit of your choice in the middle of your dough. Bring up the bottom portion to cover the berries and sprinkle of few more on top of this first fold. Pat the folds together so they stick and cut into scones and place on lined baking sheet. Continue with topping and baking instructions. 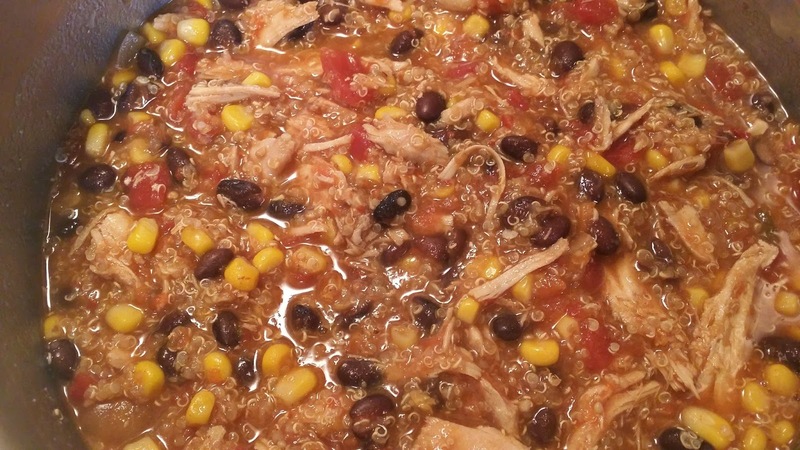 Dump the following ingredients in the crockpot and cook on low for 6 to 8 hours or on high for 4 to 6 hours. Length of time will be determined by your chicken; cooked or uncooked. 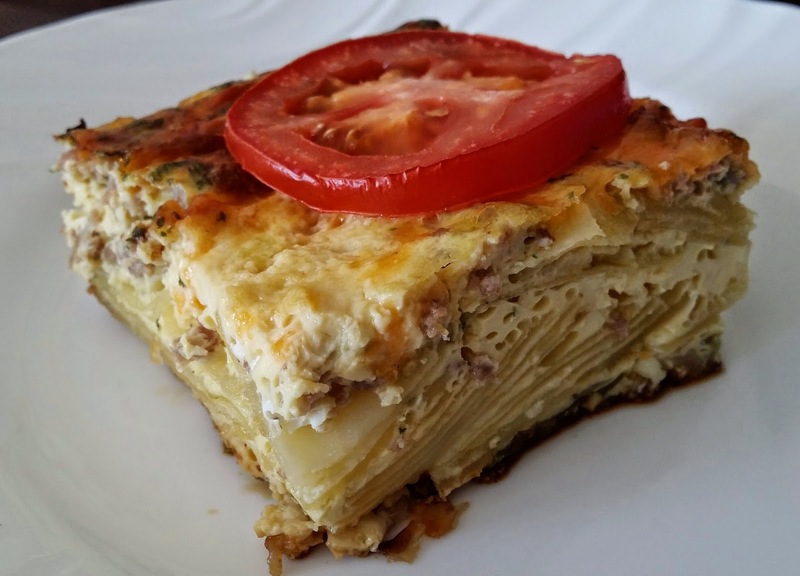 This is great for any meal, not just breakfast! You can substitute ham for the sausage or use any veggies you have on hand. 1. 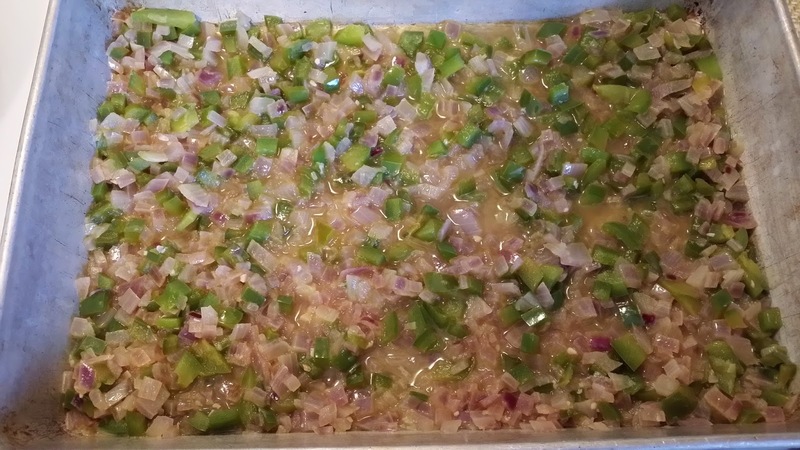 Chop pepper and onion fine to medium, saute in coconut oil until firm, but tender. Add chicken broth as needed, using about 1 C.
2. Oil a 9x13 pan and cover bottom with veggies. 3. Slice potatoes thin, layer on top of veggies. Sprinkle with salt and black and red pepper. 4. Saute sausage adding chicken broth as needed. Squeeze out grease with paper towel. 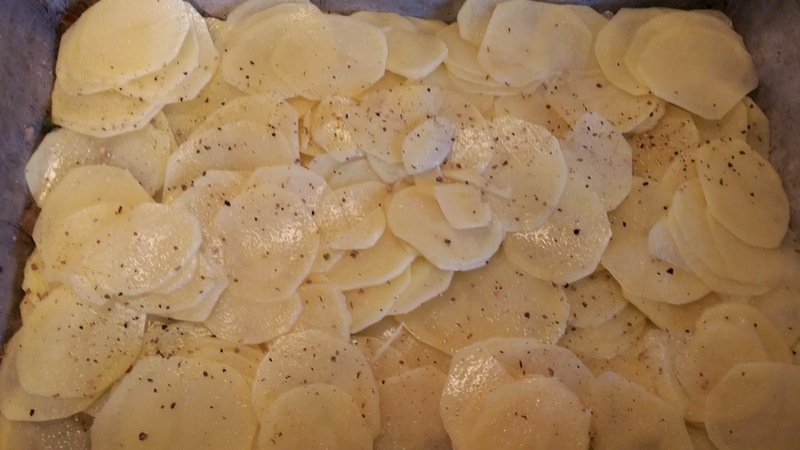 Layer on top of potatoes. 5.In a bowl whisk 12 eggs, milk, left over chicken broth, parsley, tarragon and 1/2 t salt. Pour on top of other ingredients. 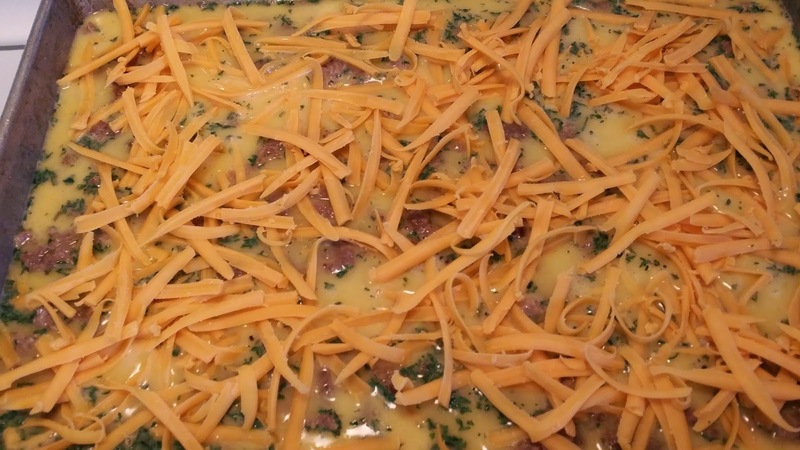 6.Grate cheese and sprinkle on top. 7. Bake 350 for 50 minutes, top with sliced tomatoes. Bake 10 minutes more or until golden and toothpick comes out clean. You may also bake this on the grill. My favorite way to do it. You say you don't like tuna? Try this, it's a great source of protein, especially if you are pregnant! 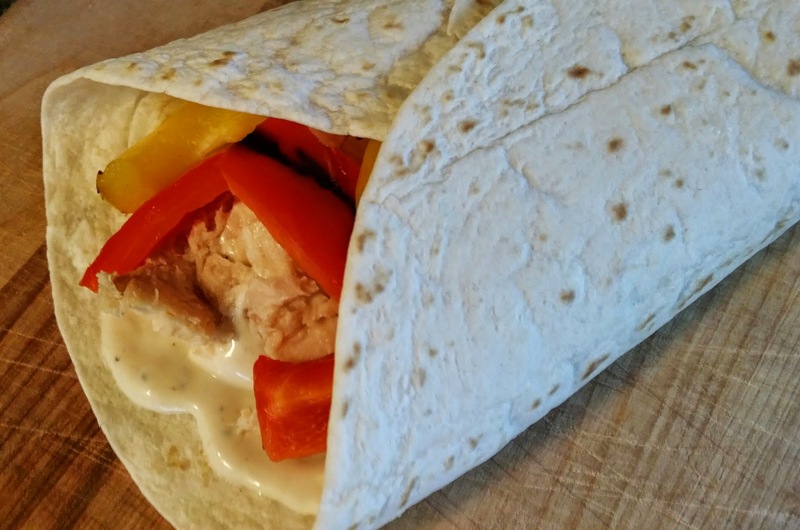 I was surprised at how the peppers masked the tuna flavor and I like tuna! Mix equal parts of the dressings and spread down the center of a tortilla. 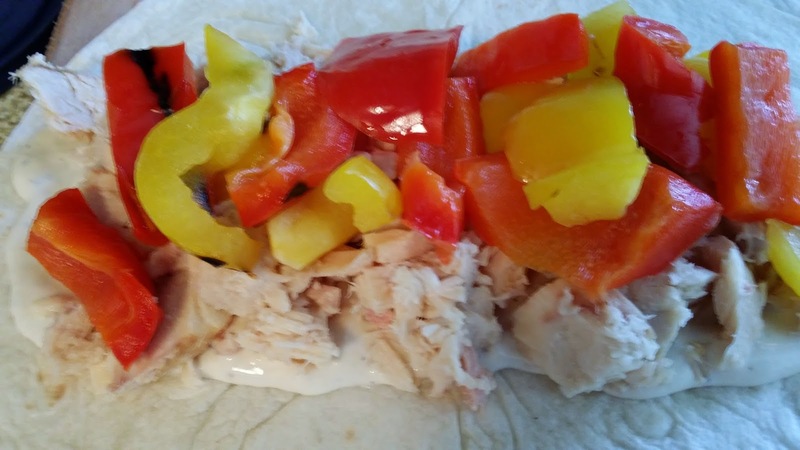 Top with tuna (drained) and peppers. Enjoy this super easy meal. If you don't want to roast the peppers yourself you can buy them canned. You can substitute any veggies that you have on hand. The peppers give it a nice sweet flavor. Kicken Chicken seasoning from Webber. Whole wheat spaghetti or angelhair pasta. Salt everything as you go for best results, including pasta water. Cut up veggies in bite size pieces, drizzle with coconut oil and roast on 450 degrees until tender, oven or grill. Season chicken with seasoning and grill. Heat alfredo sauce and add to the pasta. 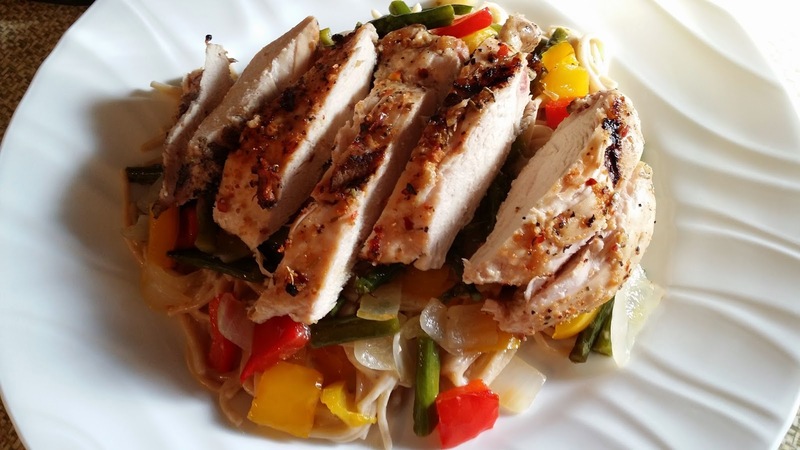 Plate pasta, veggies and sliced chicken breast, in this order. 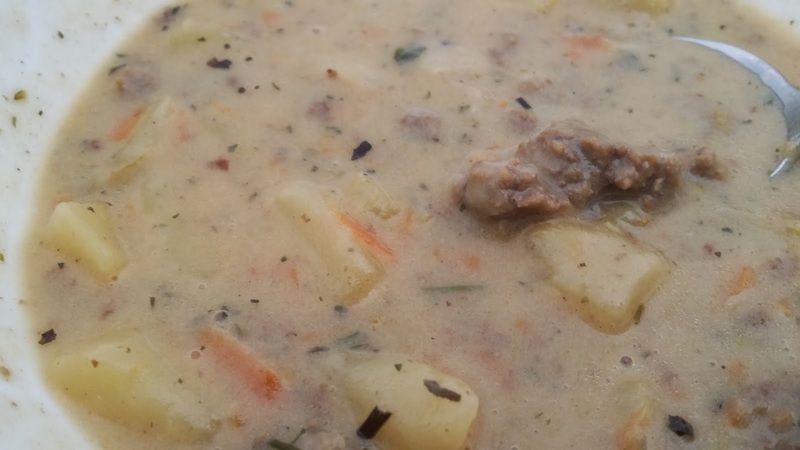 "A good hearty soup", a friend of mine said, and that it is. In another small pot melt 3T butter and whisk in 1/4C flour, cook for 1 minute whisking, adding broth if needed. Add to soup when potatoes are tender. Bring soup to a boil stirring constantly while it thickens. 1C milk, cream or half and half, depending on how rich you like it. Salt to taste if needed. I grew up on mashed potato soup...it's really good, but I'm kind of sick of it and love the pesto in this one and chunks of potatoes. 2 Cups Milk, half and half or cream, to your tasting. Fry Bacon and remove from fat and set aside. Add Sausage and Onions and fry, adding the Potatoes and Butter when it's almost done. Add the Chicken Broth, bring to a boil and simmer until the potatoes are tender. Add the milk and Pesto and heat through. 2 Cups fresh Basil or parsley leaves, packed then blanched so they don't turn brown. 3 Garlic cloves, finely minced. (I do this in the food processor before I mix up the pesto) you can get the minced in a jar, way easier! Place parsley leaves in small batches in food processor and whip until well chopped. Add about 1/3 the nuts and garlic and blend again. Add 1/3 of the Parmesan cheese; blend while slowly adding about 1/3 of the olive oil, stopping to crape down the sides. Process until it forms a thick smooth paste. Repeat until all ingredients are used up. I freeze in small Dixie cups. My go to cookbook for anything new; I know it will be good!